Every afternoon, as the SF State women’s soccer team runs through daily drills at Cox Stadium, head coach Jack Hyde, whistle in hand, loiters close to the sideline as he watches the players run drills. His body is completely still, with his hands clenched and eyes fixated on the field, anxious to jump in and teach. “He’s always is trying to get his players to the next level, even if we think we’re on the top of our game, he tries to push us harder,” said senior Mari Mendizabal. 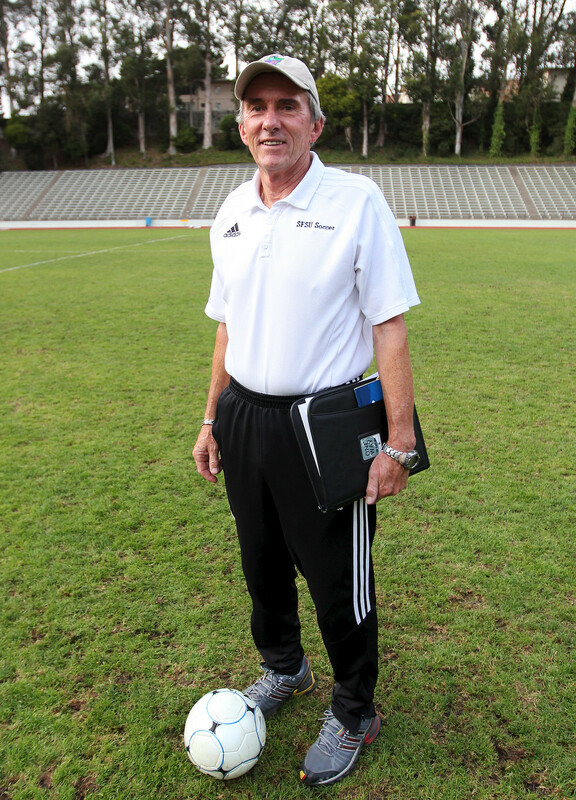 This is Hyde’s 34th season as head coach of women’s soccer. Under his leadership, the team was as a recognized sport at SF State, escaped budget cuts, advanced to the NCAA Division II National Championships and won the school’s first ever California Collegiate Athletic Association conference title. “Sometimes you don’t walk straight into the job that you love. You’ve got to work hard to get there. I was joking with them (women’s soccer players) yesterday, when I got off the boat here, nobody ran up to me and asked if I wanted to coach. I had to work hard,” said Hyde. Born in Birmingham, England, Hyde left Great Britain in 1968 and lived in Africa and, eventually, Canada for a year where he worked as an engineer. He moved to America in 1978 to take over as assistant coach of the North American Soccer League for the Oakland Stompers. Hyde left his coaching position with the Stompers the same year. In 1979, the then current men’s soccer coach Luis Sagastume recommended Hyde for the position and Hyde was hired. When Hyde arrived at SF State in 1979, the school didn’t recognize women’s soccer as an official university sport. Women who wanted to play soccer were playing at the club level, but didn’t get the funding that an official sport like men’s soccer did. In 1982, Hyde played a role in changing that. “We got a petition going around, and we got over 60 or 70 odd names that said they wanted to play and (SF State) accepted and created a woman’s program,” said Hyde. In 1982, SF State agreed to acknowledge women’s soccer as an official sport and added it to the athletic program. He continued to coach both the men’s and women’s side until 1994 when current SF State men’s head coach, Joe Hunter, took over the men’s program. Hyde agreed to be women’s head coach and has held the position for 34 years and counting. But his journey with SF State wasn’t so smooth. In the early 90s, the athletics department lost nearly 80 percent of their operating budget. “It looked as if we were going to fold, not have athletics,” said Hyde. He and many others from the SF State athletics department went to the center of campus to convince students to vote on a referendum, which provided the lost 80 percent of funding for SF State athletics. The department prevailed with a passed referendum. In 2002, SF State advanced to the NCAA Division II National Championships for the first time. In 2010, SF State won their first conference title. “We took the Gatorade water (bucket) and poured it on him (Hyde) and he was so happy,” said redshirt senior Nicole Smith, reflecting on their first conference title. Their current record stands at 1-4-1 record conference record (2-4-2 overall). They play against teams that have more money than SF State and that can create a disadvantage for Hyde. “There’s a little disparity, other teams have more money than we have. They’re able to hook the better players. That’s just a matter of fact,” said Hyde. 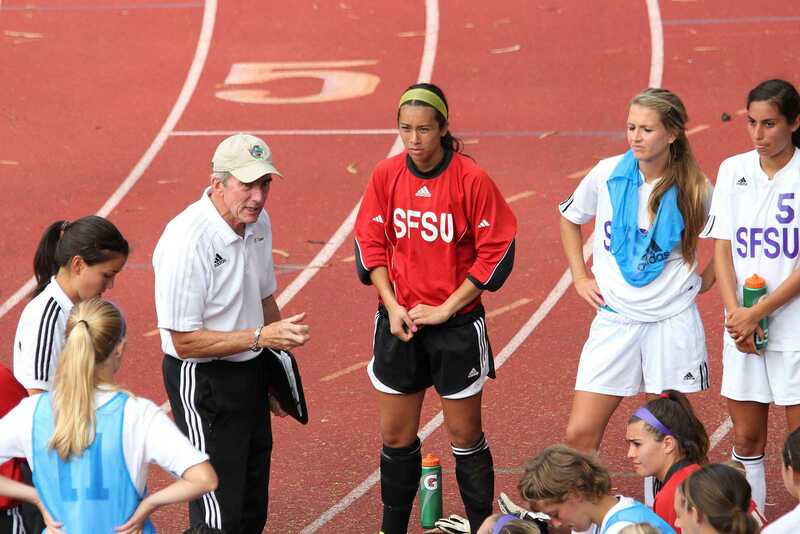 Still, budget hasn’t deterred him from meeting his goals for SF State women’s soccer. “He’s constantly making sure we are getting all the resources we need, whether it’s athletic training or tutoring. Anything to push us to be a better person and better soccer player,” said Smith. Hyde, although dedicated to SF State women’s soccer, isn’t certain about the length of his stay or retirement.